Single Limb Training – The Most Important Thing You’re Not Doing in the Gym! A chain is only as strong as its weakest link. It’s a saying we’ve all heard and understand, but when it comes to strength training it’s a simple principle that is often ignored. Over 14 years working in gyms, I’ve seen the same pattern time and time again – the vast majority of people training for strength or aesthetic purposes doing almost all of their weight training with a barbell. What’s wrong with this? Barbells are great aren’t they? A barbell connects everything. It’s a joined up system, meaning that the body works as a collective unit. Take the bench press for example. Although both hands grip the bar, there’s a good chance that the work distribution between both limbs isn’t equal – there’ll be a dominant side (usually the right hand side in most people) doing more of the work. 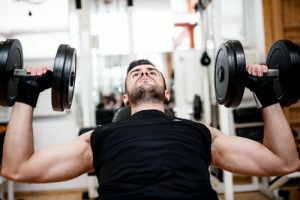 You can test this for yourself – grab some medium-heavy (around 80% of the weight you’d normally do) dumbbells and do some seated dumbbell shoulder presses (it must be seated, because you’ll remove the temptation to cheat with a push press) and see if both sides fatigue at the same rate. If they do, great – you’ve got a pretty spot on distribution of strength. If they don’t, you’ve exposed a weakness in the chain and if you want to build real strength and muscle, you’ll have to address that pretty quickly and effectively. It’s not just the upper limbs that have this problem either – with squats there’ll be a similar pattern. You’ll likely find that one of the sides (again, likely to be the right in most people) is dominating the work, leading to an uneven strength pattern developing. Why is uneven strength a problem? When one side of the body is stronger than the other, it can lead to joints (particularly in the spine) being pulled slightly out of alignment. This manifests itself with pain and structural change, which affects the ability of a particular joint to function as it should. 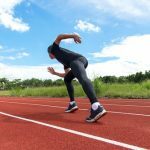 In any sport where you need to use both sides of your body (football, rugby, basketball, sprinting, climbing, weightlifting etc), having an uneven strength distribution means you’ll always end up with a weakness in your performance. Being significantly weaker in one half on your body is a real issue if you want to perform and compete at your best. If you compete as a fitness model or a bodybuilder, an uneven muscle distribution is a huge problem. Aesthetic sports place a huge amount of the available points on proportions, balance and even distribution of the musculature, so glaring imbalances will be both highlighted and punished. If one side is significantly stronger than the other, it will be highlighted in exercise technique – this means on presses the bar will rise unevenly and in squats it can lead to the same problem. Also when squatting it can lead to a ‘corkscrew’ effect, where the body rotates as the squat is being performed. This is a real injury risk so needs to be corrected. The way we train the upper and lower body in this context will vary, so we’re going to split them up for the purposes of the article. However, the principle for both remains the same – we use a lot of single limb training in our programming. First of all you need to include a lot of dumbbell work into your training. Where possible, substitute barbell work for dumbbell work in the upper body – with the lower body it’s slightly different, which we will get onto in a moment. Using dumbbells forces each arm to work on its own, meaning it will have to perform the work without any help and support, forcing it to work harder and eventually catch up with the stronger limb. It also improves technique as you’ll end up with better strength and co-ordination across both sides. For the next 12 weeks, use dumbbells in place of a barbell in any upper body work and watch your strength imbalances iron themselves out. Take a weight you can barbell bench press for 10 reps maximum. Say it’s 60kg. Now, try to do the same with two 30kg dumbbells, which is collectively the same weight. See if you can manage 10 reps – my guess is that either you won’t be able to, or if you can it’ll be much harder! In this case you’ll still use a barbell, but the emphasis will be on isolating the individual legs, which is easier to do. With the upper body it’s nigh on impossible to isolate single arms with a barbell because they both need to grip the bar! Isolating the legs can be done with exercises such as lunges and split squats. These two form the basis of a good leg training programme anyway, but they are often overlooked in favour of more glamorous exercises such as barbell squats. As a rule though, split squats and lunges are two of the most functional leg exercises there are. These two are common examples, but feel free to experiment with your own. Just work safely and effectively, starting with light weights and building them up gradually. You can also use machines with single limbs, especially the uni-lateral machines in lots of gyms. There are also other options – leg presses, leg extension and leg curl machines are all easy to adapt to a single limb exercise – you just use one leg! The same goes with cable machines for the upper body – just use the single-hand handle attachment and you can adapt the cable exercises to suit a single-limbed technique. If you need inspiration you can always head to YouTube for ideas. By forcing the limbs to work individually, you are ironing out strength and muscle imbalances which improves athletic performance, aesthetics and removes injury risk. There really isn’t a good reason to not include some appropriate single limb training into your programme in order to benefit your health, fitness and physique.